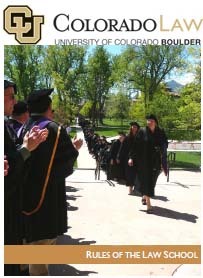 Prison/Religious Freedom Project: Since 1992, in conjunction with the Native American Law Students Association, the Clinic's Prison/Religious Freedom Project has been active in advocating for improved access for Colorado's Native inmates to their traditional religious traditions, customs, and ceremonies while incarcerated in federal correctional and state penal facilities. The Project works to address the religious observance needs of hundreds of Indian inmates while providing a valuable service to correctional facilities as well. By helping defuse tensions and hostilities, a more favorable climate for rehabilitation is created within the prisons. Tatanka Legal Times: The Tatanka Legal Times is the annual newsletter of the American Indian Law Clinic. The newsletter reports on the progress of the various Clinic-sponsored programs, casework, funding news, alumni activities, and Clinic students and their experiences. Clinic students draft the entire newsletter. To be added to our mailing list, contact us.